Is There Value Left in Low-Beta Market Sectors? Low-beta stocks have been a good alternative for clients who want safety without going to cash. But value plays in this sector are getting hard to find—even utilities are getting overvalued. Is it time to move to higher beta investments? Here’s what to watch. Since April we’ve been following our revised “Sell in May” seasonal discipline. Most advisors are probably aware of the Wall Street adage “Go away in May; don’t come back until November.” I adapt the “sell” part to “rotate to low-beta holdings.” While the strategy has worked out well so far this year, there are still nearly three months left in the seasonally soft period before the “buy” signal hits in late October or early November. At that time I will start looking to rotate into higher-beta holdings. But that leaves the question of what to do with new investors. Is this the time to be committing more money to the same low-beta holdings? The answer provides an interesting look at the markets. 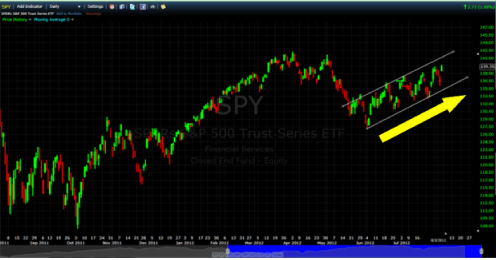 Despite what appears to me as horrid fundamentals, the market, as shown in Figure 1 using SPY, the S&P 500 tracking ETF, is definitely in a technically solid bull trend, and looks like it could challenge the year’s highs set in March. Despite what seems like endless whipsaws from Europe’s news de jour, volatility has actually diminished substantially since the third and fourth quarters of 2011. 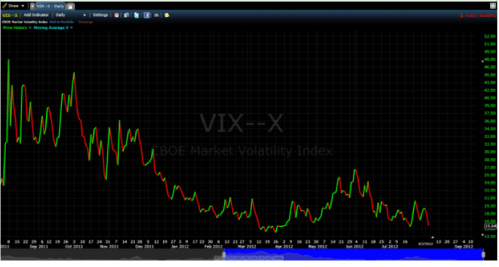 This can be seen in Figure 1 of SPY as well as in Figure 2 of the VIX. In Figure 3, I have graphed the S&P Low Volatility Index (green line) vs. the S&P High Beta Index (blue line) for the past year. While the low-volatility index is the clear winner for the past year, its relative gains have come from the “sell” seasons, to the left and right of the two vertical lines. This brings me back to my specific question “After a run of low-beta vs. high-beta stocks, is there still value to be found in low-beta holdings?” In general, considering the market and macro view as having turned somewhat negative, low-beta holdings can be a source of security in turbulent times. However, if they have become too pricey, could it be a better strategy to literally “go away” into cash? Or, if you see this as a market/economic bottom, is it time to look at higher-beta offerings? 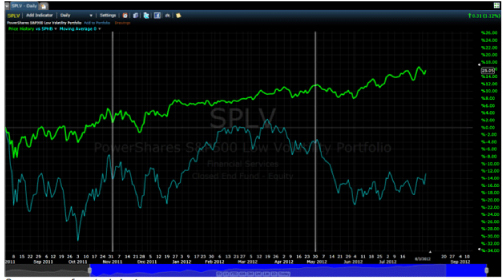 In Table 1, below, I have created a chart of the top sector holdings for both SPLV and SPHB. 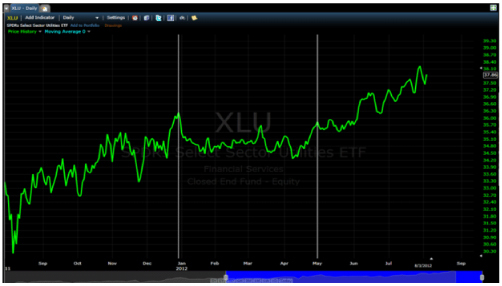 Then I looked at the current P/E ration for each sector, using the SPDR sector ETF or the Vanguard ETF for the Information Technology sector. From the table above, we see SPLV is trading at a P/E premium to SPY of 17%, while SPHB is trading at a discount of over 11%. Unfortunately, there is not enough history to the indexes to look at historic relationships, so we’re left to guess at what levels mark over- and undervalued. However, I do think it is a safe conclusion to say that SPLV is getting pricey, and therefore may not be the low-beta play that one might be expecting should we have a market decline. Delving deeper into the data, in Table 2, I ran a simple screen on utility stocks (the criteria are listed in the footnote on Table 2). Suffice it to say these are pretty simple criteria and rather low hurdles to expect a stock—especially a utility company stock—to clear. The market has gone into a “risk on, risk off” mode for the last couple of years. You can see the cycle by comparing Standard & Poor’s Low Beta and High Volatility indexes. Clearly, on a one-year basis (as seen in Figure 3), the low-volatility index is the clear winner. The question is, can low-volatility sectors, and stocks still outperform, or do they need to correct to bring valuations down? 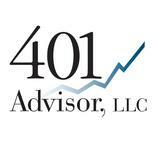 The answer to where to invest lies in your macro view of the market. As long as uncertainty persists, (fiscal cliff, election, Europe, slowing global economies), there will always be demand for lower risk investments. And in a near-zero interest rate environment, low beta stocks have offered an investment option. But after a solid run, relative to higher risk (higher beta) stocks, are lower risk holdings setting up for a normal mean reversion correction? Conversely, if your confidence is high that we somehow muddle through our current list of problems, valuations are getting very compelling, as historical “growth” sectors are becoming value plays. In digging deeper into the index holdings, there do appear to be a few value plays left. Personally, I’ll try to continue to find the individual stocks that meet my criteria in the low-beta sectors. But I’ll be watching my screens carefully for SPHB to gain solid momentum over SPLV. Historically the market is positive after presidential elections, and SPHB being both a bullish play and an undervalued bullish play could add some pop to client portfolios for the year.